This past week was some wild ride. After a weekend of pleasant social occasions, including some of the best roasted oysters ever, I braced myself for the first day of classes at work on Monday, constantly reminding myself that I pressed the reset button so that the past was past and I’d do what I could do to detox the tension at work. I even took to wearing a “Hiss Less Purr More” button. The work atmosphere, as far as I could tell, felt much better, which was helpful since I had a ton of things to do that required a lot of attention. Of course, there was the shocker about David Bowie, which seems to have affected every member of my generation. It seemed like for the past few months every time I turned on the radio I heard “Under Pressure.” Now I have listened to a lot of Bowie that I skipped after the 80s, and I am trying very hard to get “Space Oddity” and “Starman” out of my head. 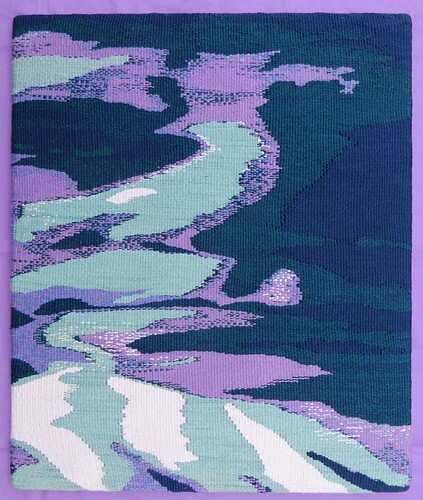 That’s right, my “98% Water” tapestry was juried into the American Tapestry Alliance Biennial 11. Well, you can imagine that it was very hard to listen to anything in my class after that. It will travel to three museums with the exhibition in South Bend, Indiana, Topeka, Kansas, and San Jose, California in 2016 and 2017. This was the first time I have entered my work in a juried competition, and the first time I have entered any show other than a local show. After I sent in the application, I wondered what on earth was I thinking and I was embarrassed that I was trying to run with the big dogs. 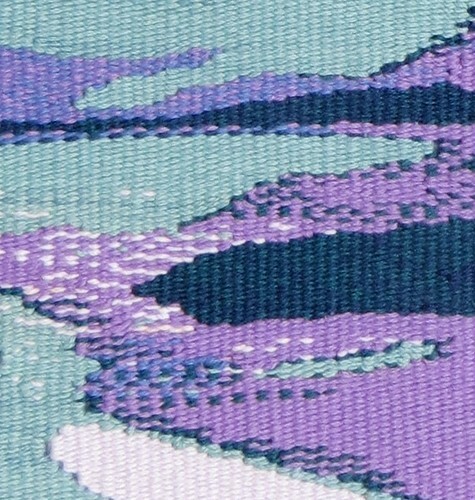 It was one of 36 tapestries chosen from 221 entrees from all over the world. Several other acceptances came from my regional tapestry guild, Tapestry Weavers South. Then I got home from class, picked up the phone to call Pam with the good news, and found a message from my sister that my grand-nephew’s 35 year old father had a massive stroke. This is a major deal because my grand-nephew is like a grandson to me and his life is already very difficult, and my sister and brother-in-law already have a great deal on their plate with a seriously ill parent and their own health issues. I won’t go any more into that except that after two surgeries and a very touch and go situation, this young man is conscious and has a better prognosis. Hopefully he will fully recover, but I request that you hold this family in the light. On Tuesday, I picked up the keys to my new studio space at the Church of the Covenant and began moving my stuff in that night. This is making me deliriously happy. On Wednesday, the news about Alan Rickman broke my heart. I don’t have many celebrity crushes, but Alan Rickman was at the top, just above Colin Firth and Aidan Quinn. I didn’t see DieHard, and only the first Harry Potter movie. I guess I understand why all the headlines say Snape or Gruber, but I loved Sense and Sensibility, Galaxy Quest, Love Actually, Dogma, and several other of his lesser known movies. He made a great villain, but he was also a great comedian and a great romantic. Maybe I’ll watch the other Harry Potter movies now. And I definitely plan to see Truly, Madly, Deeply after seeing the clips online. Then boom, I went to a good friend’s Facebook page to send them a message along with a few other friends proposing to get together for beginning of the semester drinks and found that I had been unfriended. This has rocked my world a bit more than I expected. It was not an accident. I’ve struggled with whether to ask why. To tell you the truth, I’m not sure I want to know. I’m not sure that I can take talking about it without crying. Hopefully later when the hurt subsides a little I will reach out and see what can be mended, if anything. But I don’t take this loss, or any loss of a friend lightly. I am grateful that I have many friends now. At one time I could count the number of good friends I had on one hand, and having so many people rooting for me and genuinely liking me will help me through it. I decided to drop the library studies class. Since I registered for the class, the studio happened and the Biennial acceptance happened, and my laptop broke. I want to spend my spare time doing art. I need to spend my spare time doing art. In fact, I’d rather spend my spare time working and doing art as my main thing, but you know, that ain’t gonna happen any time soon! Sandy has been amazing lately. Our relationship continues to get better. We have booked a trip in May that will take us by train from Minneapolis to Glacier National Park and west to Seattle, then south to Portland, where we will meet up with Pam and I’ll see another friend at Pam’s cabin at a tapestry retreat. Then we will spend another week exploring Oregon in a rental car. This is something wonderful to have on the horizon. Susan and Susanne spent the afternoon with me yesterday in Slow Turn Studio, playing with paint and yarn and glue and paper. Today I’ll take another carload of stuff over and they plan to join me again. I’ll post photos soon. Then it’s back to work on Tuesday. I wish you all peace on this celebration of the birth of Dr. Martin Luther King. Jr. Please read this article by my friend Mark Sandlin, and be sure to watch the video embedded in the article. It will brighten your day. Namaste.